Is the floor cypress pine and has it been limed? - Or is it not yellow because it is newly sanded? Bench seats - Hi there! Wondering what the bar stools are made of? Who designed them? Thank you! Sorry, I can't tell you this, clients already owned this clock. Room dimensions - Hi can you tell me the dimensions of this room please? Sorry these are not more precise measurements, this project finished a while ago and I would have to pull up the plans from the archives! No that's fine thank you. I am just trying to work out if that layout will fit in my kitchen space. Hello, thank you for your question. These stools are from a fab Australian supplier, Satara. Wall paint - Love the colour of the paint on the wall. Can you tell me what it is ? Thanks. love the cabinet and bench top materials and colours. More detail pls! Hi, the bench tops are Corian in Glacier White, the cabinetry is a spotted gum timber veneer and polyurethane in Lexicon 1/4 strength bu Dulux. Splash back is mirrored glass. Seating is a priorityIn a busy household, a G-shaped layout with a kitchen bar attached is a real winner – it turns this functional space into the heart of the home. Any time of the day, the cook can have a natural connection with family and friends. Here, the three stools are upholstered for extra comfort, complemented by the three pendant lights for perfect symmetry. Create contrastContrast is a great way to add interest to an interior. The contrast of light or white coloured cabinets teamed with a darker colour is a very elegant look. Using a solid dark colour can sometimes feel a bit heavy, but using a dark timber colour that has variations in tones throughout will soften the look and make it feel more inviting. If you are planning an all-white kitchen and are concerned that it may be a bit too stark, you could consider adding some extra interest and depth with the use of timber or timber look panels and cabinet fronts. Adding texture needn’t involve making lasting changes to your kitchen. 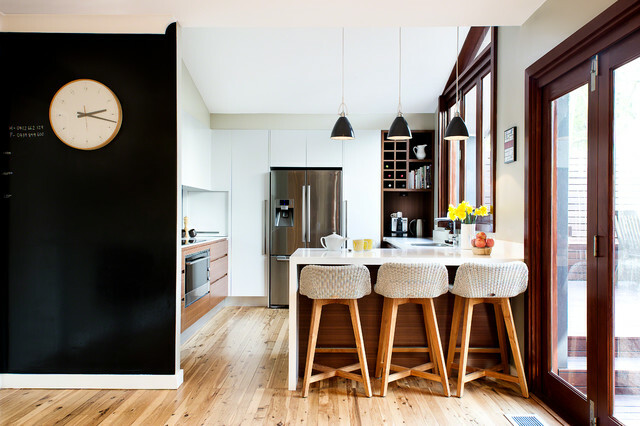 Updating the stools or pendants with texture in mind will achieve a similar result. In a shelving unitCreate a small shelving unit among the kitchen cabinets. This discreet shelf has space for 12 bottles as well as room for cookbooks and a jug. 9. Cypress pineCallitrisCypress pine is a softwood found throughout Victoria, western NSW and central western Queensland. Colour: Cypress pine ranges in colour from light yellow and light orange to light brown, with occasional dark brown streaks. Texture and grain: It has a generally straight grain with a fine, even texture. Numerous tight knots are common. Если перед вами стоит задача разместить в один ряд несколько повторяющихся предметов — будь то осветительные приборы, подсвечники, вазы или барные стулья, — всегда помните: нечетное количество зачастую окажется более интересным и выигрышным, чем два или четыре в ряд. Размещение в линию Если перед вами стоит задача разместить в один ряд несколько повторяющихся предметов — будь то осветительные приборы, подсвечники, вазы или барные стулья, — всегда помните: нечетное количество зачастую окажется более интересным и выигрышным, чем два или четыре в ряд. Aggiungere un elemento che sia bello da toccare non significa a tutti i costi stravolgere la cucina con modifiche definitive. Per ottenere un buon risultato, basterà dare una rinfrescata agli sgabelli o alle lampade.